It's easy to follow the Atkins low-carb diet if you're also following the gluten-free diet. Numerous Atkins products—shakes and bars—are labeled gluten-free, and most of the foods recommended on the diet are gluten-free, as well. In fact, the Atkins diet—which cuts carbohydrates from grains to zero in the diet's initial weeks and then gradually ramps them back up—shares the title (along with the South Beach Diet) as one of the most gluten-free-diet-friendly weight loss programs around. However, if you're following the Atkins diet and you also need to eat gluten-free, you need to be aware that not all foods listed on the Atkins diet are gluten-free. You'll most likely be fine in the first two phases of the diet, but start to run into approved foods that contain gluten in the last two phases. You can't just assume that if a food is Atkins-approved or a product is Atkins-labeled it's also gluten-free. The steps and the list of gluten-free Atkins-branded products below can help you stay gluten-free as you're losing weight with the Atkins diet. Atkins Protein Powder. Gluten-free. Atkins-branded protein powder comes in two different flavors: Milk Chocolate and Vanilla. Both are considered gluten-free. Atkins Bottled Shakes. Gluten-free. Atkins' pre-mixed shakes come in 10 flavors, including: Chocolate Banana Energy, Vanilla Cream, Creamy Chocolate, Cookies and Creme, Cafe Caramel, Dark Chocolate Royale, French Vanilla, Milk Chocolate, Mocha Latte, and Strawberry. All are gluten-free, according to the company. Atkins Plus Protein and Fiber Shakes. Gluten-free. These Atkins pre-mixed shakes include 7 grams of fiber each. They come in two flavors: Chocolate and Vanilla. Both are gluten-free. Atkins Harvest Trail Bars. Gluten-free. Atkins Harvest Trail Bars are made with nuts and dried fruit, and contain 8 grams of protein per bar. They come in three flavors: Coconut Almond, Dark Chocolate Sea Salt Caramel, and Dark Chocolate Peanut Butter. All three are prominently labeled "gluten-free." Atkins Meal Bars. Two gluten-free flavors. 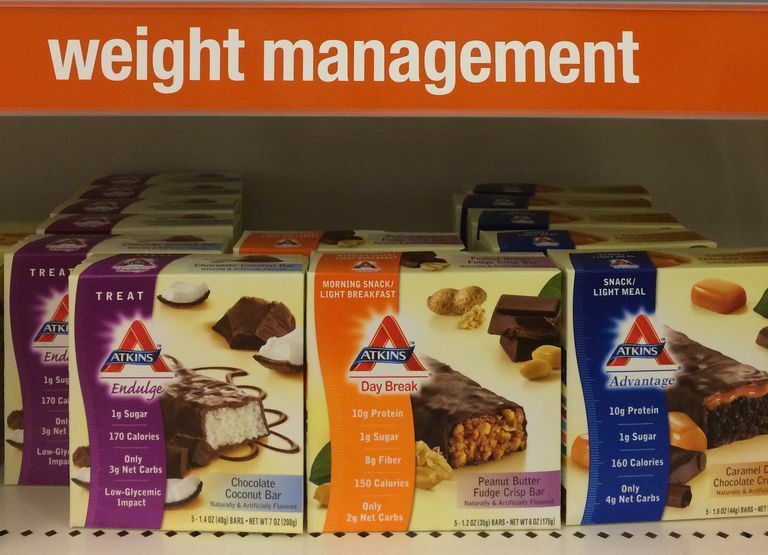 Atkins Meal Bars come in 11 different varieties. However, only two of these are considered gluten-free by the company: Vanilla Pecan Crisp, and Chocolate Almond Caramel. Steer clear of the other flavors (many of which feature wheat ingredients). Atkins Snacks. Contain gluten. Atkins offers 18 snacks. However, the products either contain gluten or are subject to significant gluten cross-contamination risk due to shared equipment and facilities. Atkins Frozen Foods and Meals. Contain gluten. Atkins makes numerous breakfast, lunch, and dinner entrees and meals, ranging from frozen pizza to beef stew. However, these foods either contain gluten or are subject to significant gluten cross-contamination risk. The Atkins diet helps you to lose weight by restricting your carbohydrate intake, forcing you to burn fat for energy rather than sugar. In theory, this also serves to eliminate cravings for certain foods. Atkins is arranged in four phases, two of which are naturally gluten-free because they allow no grain products at all. You start by severely limiting your carbohydrate intake, and then slowly add carbs back in until your weight loss stalls or stabilizes. The first phase, Induction, is the most restrictive: it limits you to no more than 20 grams of carbs per day (read more about induction here: Atkins Diet, Phase I: Induction). You can eat meat, fish, poultry and eggs, along with some cheeses and vegetables. Since no grain-based foods are allowed in Phase I, gluten should not be an issue as long as you make sure to stick with gluten-free drinks and gluten-free salad dressing. Induction lasts up to two weeks. In Atkins Phase 2, you can eat everything you ate in Phase 1, plus you can add berries, cottage cheese (make sure to pick up a gluten-free cottage cheese brand), nuts, seeds and some juices. Again, no grain-based foods are allowed, so assuming none of your condiments contains gluten, you should be safely gluten-free in this phase of the diet. Atkins also advises that dieters can consume the company's bars and shakes during Phase 2, so see the above list of gluten-free Atkins products for your options. Phase 3 of the Atkins diet is mostly gluten-free—the only grains allowed are oats and brown rice. But if you also react to oats, or you're just not careful to choose a safe oatmeal, you could run into trouble on the gluten front. If you already know you can't have gluten, make sure you don't slip up in Atkins Phase 3. Phase 4, meanwhile, is the diet's maintenance phase—and it allows grain-based food, although the official diet website recommends including only wheat pasta, oatmeal and brown rice. To keep this part of the diet gluten-free, you certainly could skip the wheat pasta and include only oatmeal and brown rice (make sure to choose a safely gluten-free rice). Atkins warns against "carb creep," which the program says can result in weight gain once people finish the more active phases of the program. The same could be said of "gluten creep": the Atkins diet makes it simple to eat gluten-free, but it would be easy to slide back into old dietary habits once you've completed the program, and to allow gluten to sneak back into your diet. If you have celiac disease or non-celiac gluten sensitivity, that would obviously be a mistake. In fact, some people actually discover their sensitivity to gluten grains (wheat, barley, and rye) when they're doing Atkins. In these cases, people typically feel great for the first few weeks (the time when the diet contains no grain products), but then start to feel terrible when they reintroduce low-carb-friendly products that happen to contain gluten. If you already know you need to be gluten-free, you'll find that Atkins features naturally gluten-free foods in most of its phases. Just make sure not to let carb creek and gluten creep sabotage your diet... and your good health. Can You Use SlimFast to Lose Weight If You're Gluten-Free? Is All Chocolate Really Gluten-Free, or Do I Need to Be Careful?